Refreshing, light, packed with protein and greens — this is a much-appreciated center-of-summer, center-of-table, recipe. The real beauty is that much of it can be made up to 24 hours in advance. Do your shopping, poach the chicken and make the vinaigrette up to 24 hours in advance. 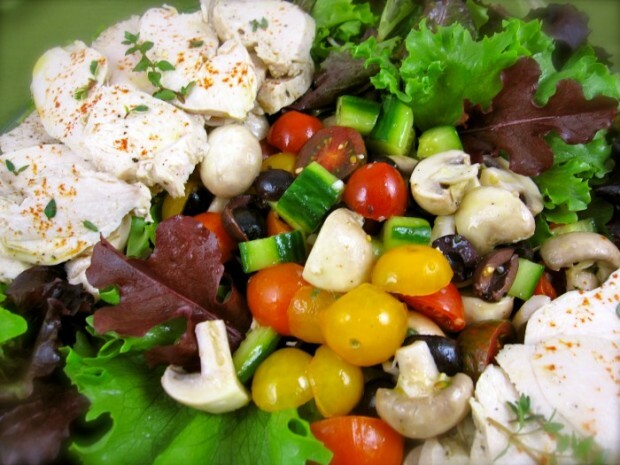 The vinaigrette serves as a marinade for the chicken and vegetables, and you would toss the remaining dressing with the greens prior to serving. Any other vegetables that you enjoy may be substituted for, or added to, my vegetable selection: Artichoke hearts, radishes, asparagus and roasted eggplant come to mind. Place chicken, stock or water, reserved lemon, dried herbs, bay leaf and vegetable scraps, if using, in a heavy-bottomed pot. Season with kosher salt, if you are using water or unsalted stock. To season brew, bring to a boil and reduce liquid 20-30 minutes. Place chicken breasts in seasoned, boiling liquid. When water returns to a boil, stir breasts around, then turn off heat. Cover tightly and let sit in poaching liquid until just cooked through, 20-30 minutes, depending on thickness of chicken. Make a vinaigrette by whisking together oil, lemon juice, garlic and chopped thyme. (This may be done up to 24 hours in advance.) Set aside 1/4 cup for tossing with greens before serving. When chicken is chilled, slice into 1/4-inch pieces. Drizzle 1/4 cup of dressing over chicken, coating both sides. Season chicken with kosher salt and freshly ground pepper. Refrigerate until ready to assemble platter. Toss cucumbers, mushrooms, tomatoes and olives in remaining dressing. Let sit in marinade, refrigerated, at least 1 hour and up to 4 hours, occasionally stirring. Rinse salad greens well. Spin or pat dry, then toss with reserved 1/4 cup dressing. Season greens with kosher salt and freshly ground pepper, if desired. Center the marinated vegetables on your platter and arrange greens and chicken around vegetables. Garnish platter with lemon zest and thyme sprigs. More Recipes Filed Under "Chicken salads"